The first step in understanding harmonic resonance patterns is to study cymatic patterns created by vibrating sand or water. Each pattern is the result of specific harmonic frequencies reflecting inside a container, such as a circular cup of water. For instance, a pentagonal geometry is formed either by one frequency resonating at the 4th wave partial of the prime resonance frequency (4 : 1 = 5 vertices) or two frequencies forming an interval, such as a perfect fifth (3 : 2 = 5 vertices). In both cases, we simply add the two sides of the harmonic proportion to find the shape of geometry. Cymatic patterns can also form in low-pressure zones that form between two regions of pressure differential (described in an earlier discussion about damping wells). In a spinning bucket of water, cymatic patterns arise from the velocity differential between the outer edge of the bucket and its center axis. As before, the geometry is determined by the frequency proportion created. Swirling weather patterns work the same way, spiraling around a center while closing into an approximated circle in the center. In recent years, the most powerful storms occasionally form cymatic patterns in the clouds, even tracing out a pentagram inside a pentagonal eye. Similar formations have been found on other planets, such as a giant hexagon around Saturn's south pole. While it is obvious that the bucket acts as a container for the standing wave patterns in water, what can we say is the container for weather patterns? Most would answer 'clouds' or 'the planet' but the more correct answer is gravity. Gravity acts as a damping well in space around a planet, forming a spherical bubble within which waves can reflect and form stable patterns. The same thing happened long ago in the plasma disc of our solar system, forming planets in orbits spaced approximately at right angles along a Golden Spiral. In the process, the planets and their moons exhibit a variety of resonant properties. The most obvious is the resonant orbit of Venus to Earth. In the heliospheric current sheet of the sun, a Phi-damping well once existed in the plasma between Earth and Venus. At one edge of the well was the planet node Venus and at the other Earth. 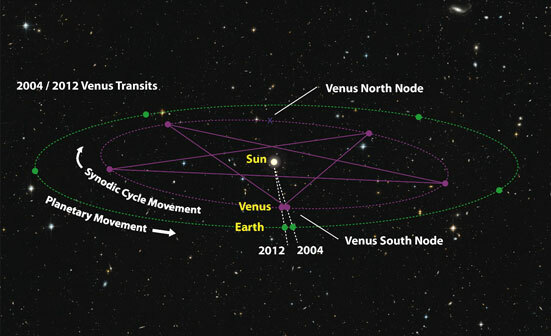 For every 13 orbits that Venus travels around the Sun, Earth travels almost exactly 8, creating the resonant proportion 13 : 8 (mentioned in the harmonic formation section). Since 13 / 8 = 1.625, the two orbits straddle the stabilizing Phi-damping eigenvector in the space between, forming the geometry of a pentagonal star in the two planet's conjunctions. 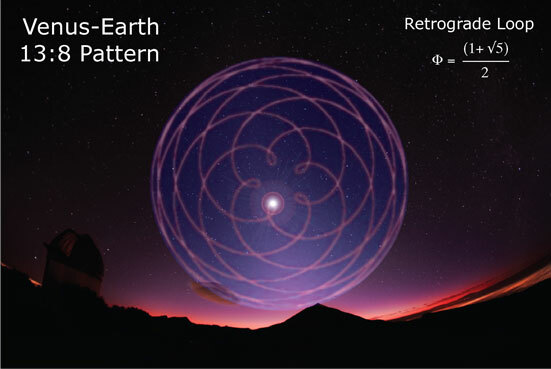 This star cymatic pattern was well known in ancient times as the Star in the East, the Morning Star, the Babylonian Star and the Star of Bethlehem. Since it rose in the sky before the Sun, it was called the 'light bringer' or in Latin 'Lucifer.' This orbital star pattern played a prominent role in many early religions and associated with the sacred feminine presence of God. This included the Hindu Vena (and Shukra), Kali, Ishtar, Innana, Astarte, Semiramis, Ashtoreth, Isis, Aphrodite, Venus, Demeter, Hathor, Ostara and Eastre. But, celestial mechanics are not the only place where harmonics help nature organize itself. At the atomic level, harmonic resonance between atoms is known as bonding. In the case of life, 99 percent of a living thing is made of water and carbon and the way in which these atomic geometries harmonize. 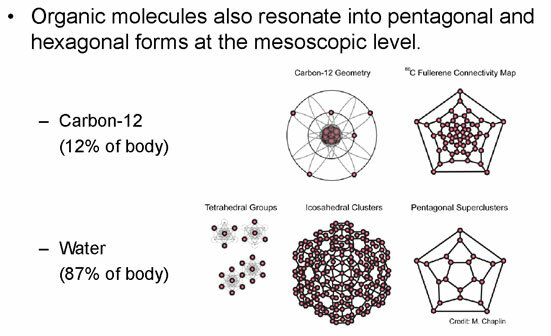 In particular, both assume pentagonal connectivity maps at the mesoscopic level where molecules cluster together. As carbon-water clusters fit together to form cells, organs and bodies, life assumes a range of organic shapes. 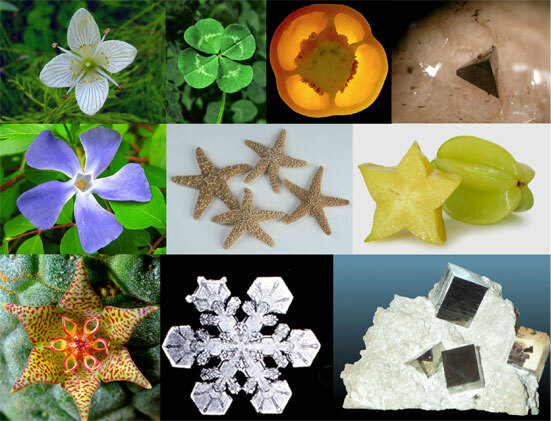 Nature's geometry is not strictly a matter of natural selection and random mutation. Atomic resonance is also at work, guiding the formation of different life forms into a limited number of possibilities which are then differentiated further by environment. 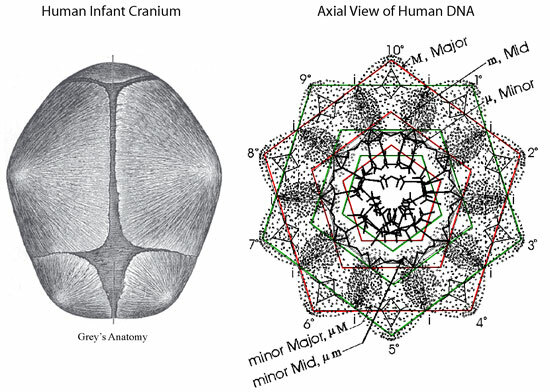 For humans, the pentagonal shape was the guiding harmonic pattern, creating a dual-pentagon arrangement in the DNA molecule, a pentagonal cranium and five fingers and toes on each side of our body. In this way, physiological shape can be described as a harmonic patterning process that emerges from a Fibonacci spiral - exactly like that of a harmonic standing wave heterodyning out of a golden ratio fractal.